Tri-Cities retail sales were mixed in Q2 as were the August sales tax collections. 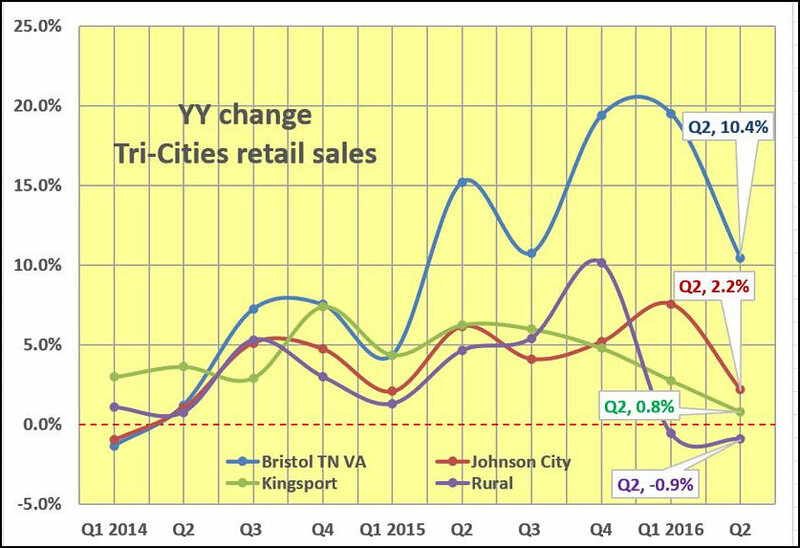 Most of the media attention from ETSU economist Steb Hipple’s Q2 report when to the horse race question of which city’s retail sales were up the highest. But there’s an interesting backstory flying under the radar. It centers on the share of sales tax collections the region’s two MSA command and how retail sales are divvied up among the three major urban areas and the rest of the region. CLICKING ON CHART RENDERS A LARGER VERSION. ut let’s look at the August collections and Q2 retail sales tax analysis from ETSU’s Dr. Steb Hipple first to get a baseline. Middle Tennessee State University’s sales tax collection report shows Kingsport-Bristol led the region’s year-over-year August growth rate, closely followed by Morristown. On the Tri-Cities level, August was the third straight month, Kingsport-Bristol has outperformed the Johnson City MSA’s collections growth rate. Here’s how the region fared compared to collections August last year. Statewide collections were 2.1% better than August last year. Hipple’s Q2 retail sales report said the three city markets had mixed results after two years of solid growth. Bristol claimed the best growth rate with a 10.4% dollar sales increase while Johnson City sales were up 3.3% and Kingsport sales rose 0.8%. “Adjusted for inflation real sales were up 9.3% in Bristol, 1.2% in Johnson while they fell 0.2% in Kingsport,” Hipple wrote. “During the second quarter, retail expansion slowed in the state and the region. In the Tri-Cities, Bristol continues to benefit from the opening of new retail outlets, while Kingsport saw the first drop in retail activity since 2013. From a county perspective, retail growth was centered in the urban counties of Sullivan, Washington (TN) and Carter. The other metro counties suffered decline in retail volume. The continued retail expansion at the national lever. The back story focuses on the sales tax collections and retail sales data from a slightly different perspective. Fueled by Bristol’s performance, the Kingsport-Bristol MSA expanded its year-over-year share of total Tri-Cities sales tax collection for the third straight month. The Johnson City MSA share has slowly declined on a month-over-month basis since March when it stood at 49.8%. The year-over-year trend line shows Kingsport-Bristol outperforming the Johnson City MSA eight of the past 13 months. 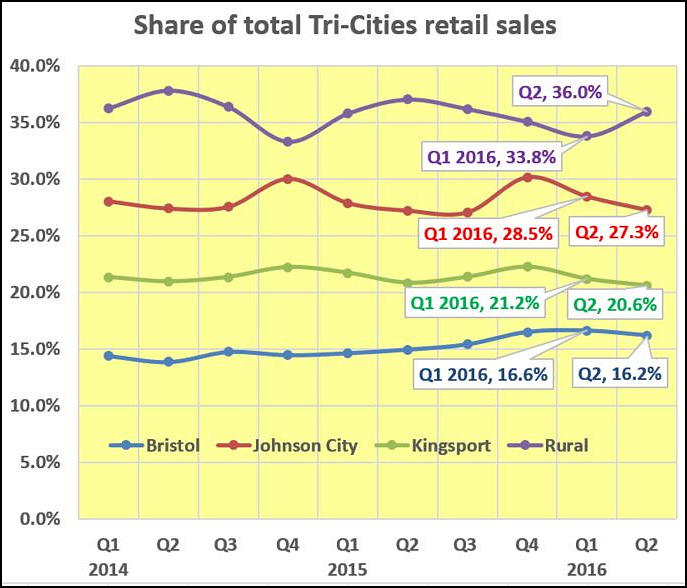 Looking at the share of total Tri-Cities retail sales based on Dr. Hipple’s data, the areas outside the three city areas saw the best quarterly growth. It was also the only component where trend line moved was moving up in Q2. The rural areas claimed 36% of total retail sales in Q2. It consistently accounts for a higher portion of the total sales, but its year-over-year growth has trended lower since Q4 last year. While Bristol is enjoying the best year-over-year sales growth rate its share of total sales is the lowest of the metro areas. It dipped to 16.2% in Q2. Johnson City had a 27.3% share while Kingsport claimed 20.6% of the total Q2 retail sales pie.